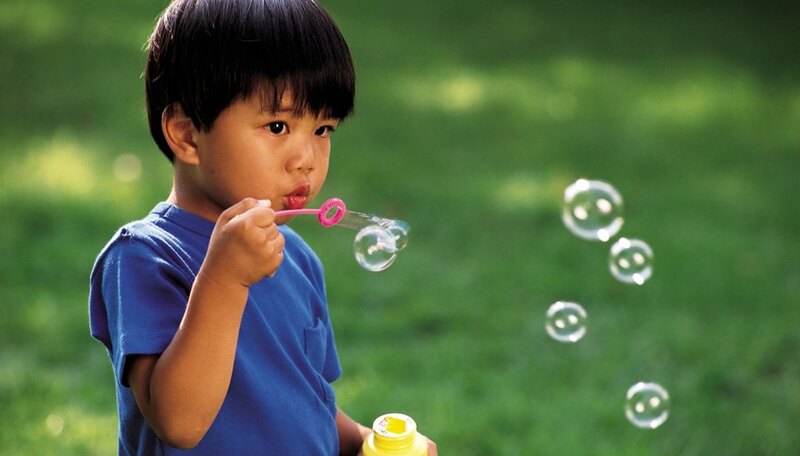 The task of making a bubble that doesn’t pop may seem impossible but it can be done. A frozen bubble is a bubble that will not pop under cold conditions. You can make a frozen bubble by either using dry ice or by going out in the cold weather. Using dry ice will allow the bubble to maintain its round form and become stiff, so it won’t pop. Apply gloves onto your hands to protect yourself from the dry ice. It is important to use gloves so you don’t touch the dry ice with your bare hands. Place several chunks of dry ice inside of the glass tank, though you can also use a wok for this project. The dry ice should sit for 15 minutes before you blow bubbles. The dry ice will create carbon dioxide gas once it's allowed to sit. Blow bubbles into the tank using the bubble solution and bubble wand. You can purchase bubble solution at your local party store or specialty shop. At the beginning, the bubbles will fall and sit on top of the carbon dioxide. Some of the bubbles will fall past carbon dioxide and touch the dry ice. The bubbles will freeze once they hit the dry ice. Pick up the frozen bubble to examine it closely. Keep in mind that the bubble will not pop once it is still close to the dry ice. Once the bubble starts to warm up, it will thaw and pop. Perform this project in a well-ventilated area. Excess carbon dioxide gas can pose a health hazard. You can also freeze bubbles during the winter, when the temperature is below freezing. You can blow bubbles and watch them freeze in the cold air.